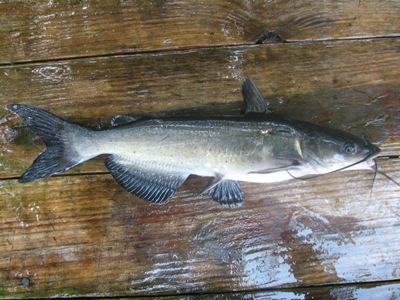 Channel catfish are common in tidal rivers and creeks of the Chesapeake Bay watershed. In areas such as the Susquehanna, Patuxent, Potomac, James, Nanticoke, they are often found from a river’s mouth upstream to the fall line and beyond. As water temperatures rise in spring, some channel catfish move upstream into out warmwater streams, and other small tributaries off from the main river stems to feed on abundant food sources. Depending on local river conditions, catfish may find themselves in saltwater, brackish, or freshwater environments. Despite traditional theories about catfish preferring muddy habitats, channel catfish will take advantage of clear, flowing water when it is available. To catch channel catfish, anglers usually fish with cut baits, including fish, crabs, squid, chicken livers, shrimp, crayfish, nightcrawlers, or bloodworms. The best baits for catching catfish in the Chesapeake Bay region often depends on habitat. Closer to saltwater, peeler crab, soft crab, bloodworms, and squid are often preferred. Farther upstream, where freshwater fish species are encountered, fishermen are more apt to fish with nightcrawlers, crayfish, or other baits. Because of their strong scent, chicken livers are a popular bait, regardless of salinity. Channel cats also take artificial lures. They occasionally surprise anglers that cast lures for bass or panfish. They are often caught with soft plastics worked along the bottom, especially those which are impregnated with natural scents or attractants. When fishing for channel catfish, location can be important. With the watershed’s incredible diversity of habitats, it can be hard to predict productive areas. In main rivers, the edges of deep channels are productive during some parts of the year. At other times, catfish will move into shallow areas, even along the shoreline. Their affinity for moving water is often apparent when tidal rips are found along changes in depth. Channel cats often congregate along these rips, patrolling a specific zone which may be near the bottom or at mid-depth. Farther up rivers, channel cats often orient to structure. They are known to associate with downed logs or rocks and sometimes take up position in eddies behind these structures. Although access can be a challenge, anglers sometimes find success by working these habitats. In the Chesapeake Bay watershed, channel catfish reach weights of 10 pounds or more, although 2-3 pound fish are more common. Channel cats make good table fare, especially in the spring and fall. They are fairly easy to clean and yield white, mild tasting fillets. Catfish fillets are typically breaded and fried although a number of recipes exist.